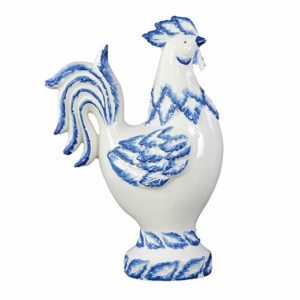 Our Laird Ivory Ceramic Rooster is quite the ladies man! He rules the roost and has been known to swoon a hen or two. In distressed shades of cream, light brown and white, Laird is a handsome addition to any home. Boasting a sense of style and personality, he’s the perfect way to make a bold statement quietly. Since the European Farmhouse style trend has arrived, we’ve seen a major influx of farm animal decor. Although, in most rustic homes, roosters have always been a classic fixture. We love to display him in our kitchen atop our cabinets and counter tops. The ceramic finish makes him super easy to keep clean and dust. Because we like to think more on the unique side, we have a few other suggestions. Try using him as a centerpiece when you’ve cooked a “farm to table” meal. 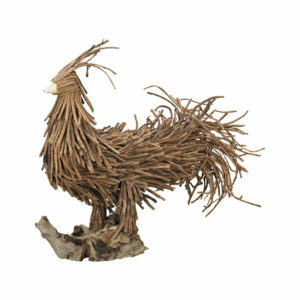 Or even use the ceramic rooster on your fireplace as a focal point. Decorate the mantle next to him with chicken wire cloches and fresh wildflowers for a dazzling farmhouse display!